Summer is over and the great glut of fruit the countryside offers is nearing an end, but lingering on in gardens up and down Britain are beautiful bunches of grapes. Grape growing is becoming popular with the average British gardener because the need for endless mediterranean sunshine to grow bumper crops is a myth – grapes good enough to eat are fairly straight-forward to grow, wine making…well that’s an entirely different thing! There are many varieties of grapes that grow in gardens in the warmer parts of the UK and simply selecting a sheltered, warm and sunny corner of the garden should encourage good growth – in no time at all your grapes will be blooming. 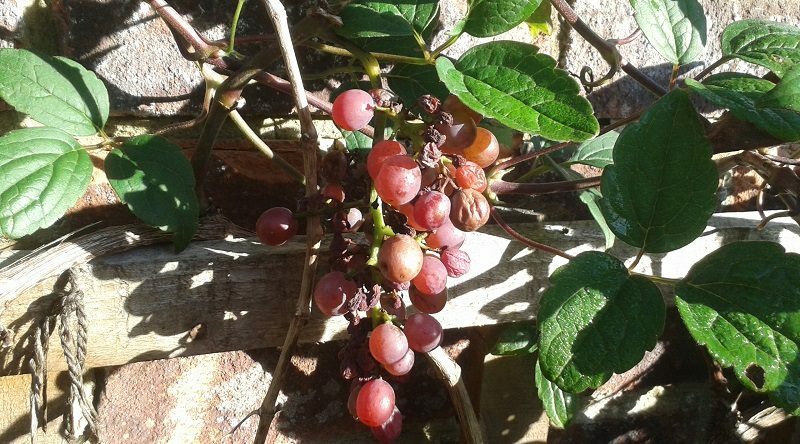 Grape growing is heavily linked to winemaking but I’m pleased to say that growing grape vines for the love of simply eating their fruits, is a popular endeavour for anyone with a spare garden wall to cover! Even if the grapes do not sprout into the bounteous bunches you dream of, they will still be ideal for juicing – and that is just what we did with our grapes this weekend. My husband and daughter harvested the ripe bunches of grapes, washed them (it turns out that a vast amount of baby snails loved living in our grape vine!) mashed them in a saucepan and put them onto the cooker to simmer. After about ten minutes of heat, the grapes had released their juice and it was simply a matter of sieving, chilling and serving before we enjoyed grape juice with our breakfast. There was no need to add sugar – the grapes are sweet enough already! We managed to make two bottles of grape juice and the process was amazingly simple.